Some superlative meals are the subject of much anticipation and others you just stumble upon. While anticipation can be extremely enjoyable, it can also lead to disappointment when the dreamed of dishes do not quite compare to what was conjured up in your imagination. The meal of happenstance comes without the baggage of expectation and is like a surprise lottery win – a complete bonus. 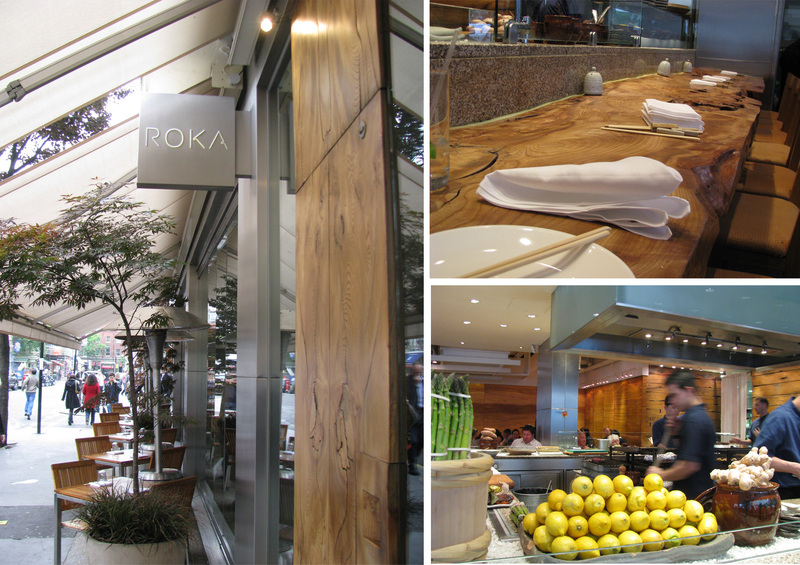 During our recent trip to London, an off-hand mention from a friend led us to discover Roka. A stroke of luck – It was undoubtedly one of the best (and most expensive) meals I have eaten and certainly one that I will remember for a long time. I had not heard of Roka before I went there and so had no preconceptions. Since then I have read many reviews – it is much written about. Roka is a well established and award winning London restaurant, (owned by the proprietors of Zuma) with branches in Macau, Hong Kong and Scottsdale. It is based on the robatayaki style of cooking (open charcoal grill) and is a Japanese fusion restaurant presided over by Chef Nic Watt. When we were there it was very busy and the gray London day meant that no-one was taking advantage of the outdoor seating (the glass walls slide open). The interior features a lot of wood but the glass walls make it very light. We sat at the wooden bar and were able to watch the chefs at work. We opted for the £75 twelve course tasting menu as choosing a la carte was a little daunting and there were so many things on the tasting menu that we wanted to try. 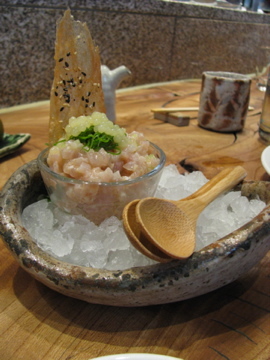 First was Namagaki no tosazu gake (rock oyster with rice vinegar and ponzu) served on an ice bed with Moriawase San Shu – a selection of sashimi (salmon, tuna and red snapper). The rare treat fresh wasabi was brought to the table and served straight from the sharkskin grater. The little wine red sprouts are benitade sprouts. 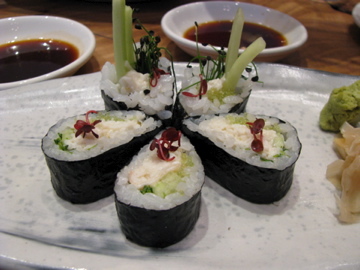 This was followed by Tarabagani Maki (king crab, wasabi tobiko, rock chives and cucumber) garnished again with benitade sprouts. These were creamy and a mix of subtle yet distinctive flavors. I particularly liked the onion-chive flavor of the rock chives. 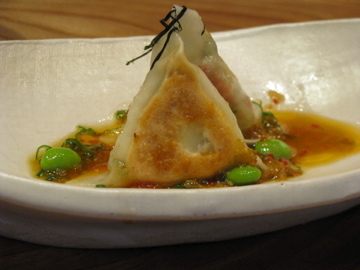 Next were Ise- Ebi to gin tara no gyoza (lobster and black cod dumplings) served with edamame. A big hit for my companion but one of the less memorable flavors for me. 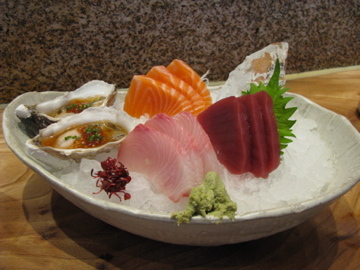 Stunning presentation is a feature of good Japanese food and Roka excels in this department with stylish presentation and beautiful garnishes that enhance the flavor and are not just for show. I am a ginger fan and so the Hamachi no tartar (yellowtail with lemon, chilli and ginger) was an easy sell for me. Tiny chopped celery gave it a refreshing crunch. The pearls are not fish roe, but are jellied ginger essence – wow! The next course was one of my favorites and was truly luxurious. I think at this point we might have started to get giddy. 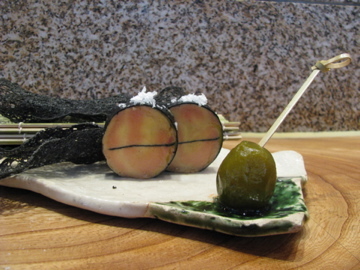 Foie gras to umeshu no ume to nama nori (foie gras with a pickled umeshu plum and nama nori). The toast was like black lace and inconceivably light. The plum was sweet and a taste that was new to me. Sweet and fragrant an not sour or vinegary as I had expected. 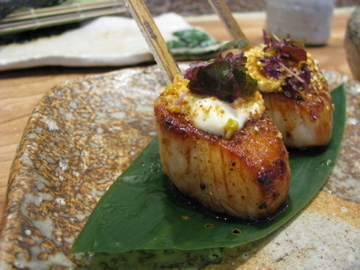 Hotate (scallop skewers with wasabi and shiso) were perfectly cooked and another winning dish that might be possible to emulate at home. 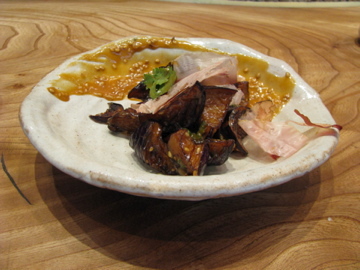 Another favorite and a surprise hit was Ko Nasu (grilled eggplant in mirin, ginger and soy). The eggplants used are the smaller japanese style which have thinner skins. They came in a bowl smeared with caramelized miso and garnished with sesame seeds and bonito flakes. This is without a doubt the best eggplant dish I have ever had and I was loathe to share it. The miso was almost like a satay sauce and I could happily have licked the bowl. The next course was Kamameshi (rice hot pot with king crab). Hot pot sounds a little humble, but in this case it comes topped with a pile of wasabi flavored tobiko (fish roe) that is stirred in at the table. Sadly I wasn’t able to take a photo before our server eagerly set to work. The hot pot is like a Japanese risotto, more soupy than an Italian risotto but with a little crunch from the fish roe. It was a very generous serving and would be a wonderful dish on a wintry day. Another sushi followed, but not sushi as you know it – beefy sushi. 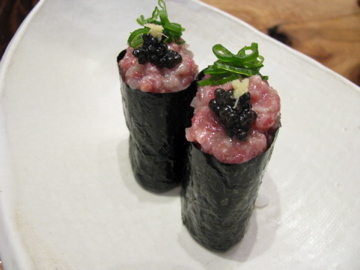 Wagyu gunkan to be precise (wagyu beef with oscietra caviar, spring onions and fresh ginger), truly decadence on a plate. I think it was at this point that we were asked if we were ready for the main course. We almost choked. Luckily we were able to find room because the two grilled meat courses that followed were among the best. 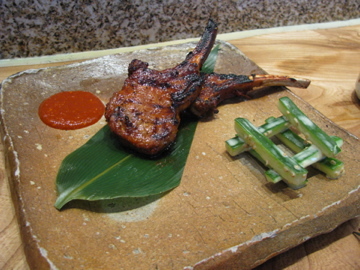 Firstly, Kankoku fu kohitsuji (lamb cutlets with Korean spices), spicy without being overly hot, tender and perfectly grilled. The cucumber was a good accompaniment. The second grilled dish was a revelation. 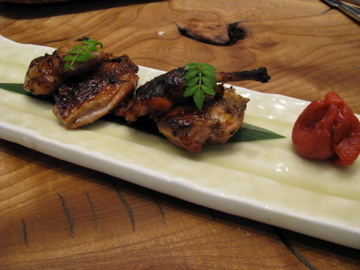 Uzura no miso zuke (quail marinated in plum wine and red miso) was more succulent than I thought any game bird ever could me. So tender and so tasty and no need for a sauce, simply garnished with kinome leaves (Japanese pepper leaf) and pickled plum. 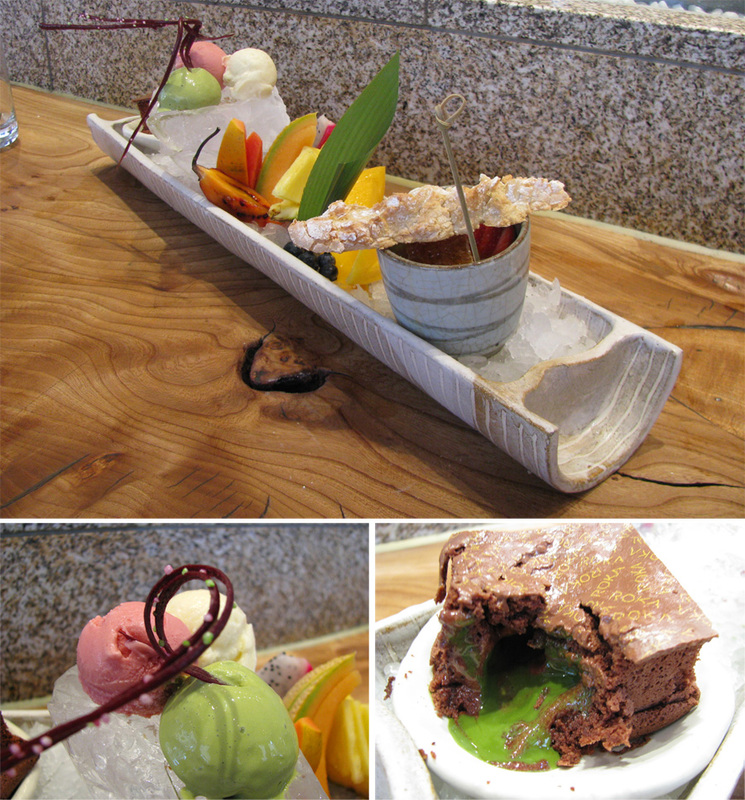 Dessert was the Roka dessert platter comprising of a chocolate ‘surprise’ cake with a shockingly bright green tea liquid center (really, we were shocked! ), a trio of ice creams (strawberry and jasmine, green tea, asian pear), tropical fruit (including dragon fruit) and a chawamushi (Japanese egg custard) with honeycomb, banana liqueur, strawberries and goodness knows what else and served with a light and crunchy almond cookie. Some of the fruits were disappointingly under-ripe, but the mango was excellent. The crisp tuile like decoration tasted even better than it looked with an intense raspberry tang. Somehow, even after all those courses we managed to clear off the dessert plate. The most notable dessert for me was the strawberry and jasmine ice cream which had a heavenly flavor. I am so glad I have the photos, or I would have trouble remembering everything we ate. Overall I thought the meal was worth the cost, given the quality and range of the ingredients used, the skill in preparation and the attention to detail. My companion described the meal as almost obscene. I certainly would not spend that much on a regular basis, but as a vacation treat it was wonderful. The presentation was sensational and the food tasted as every bit as good as it looked. It was impressive that Roka can consistently produce a tasting menu of that quality without needing a reservation. My only criticisms were that it felt like we were being rushed through and courses would appear before we had finished the previous one. The range of nationalities of the servers was fascinating but sometimes it was hard to understand the description and it would have been helpful to have a copy of the menu to remind us of the details of each dish as it appeared. Other than that the service was very good, with drinks refilled before you needed them and little touches like re-folding your napkin if you got up from the table. I think I might have to find an excuse to visit Arizona. That beefy sushi looks absolutely sick! That had to be one memorable meal. Last Friday’s ES magazine had a ‘my london’ interview with (designer and restaurateur) Terence Conran. The headline was ‘Terence Conran eats at Roka, St. John, and Sweetings.’ He praises Roka for serving ‘an inventive menu’. This blog was worth the wait! 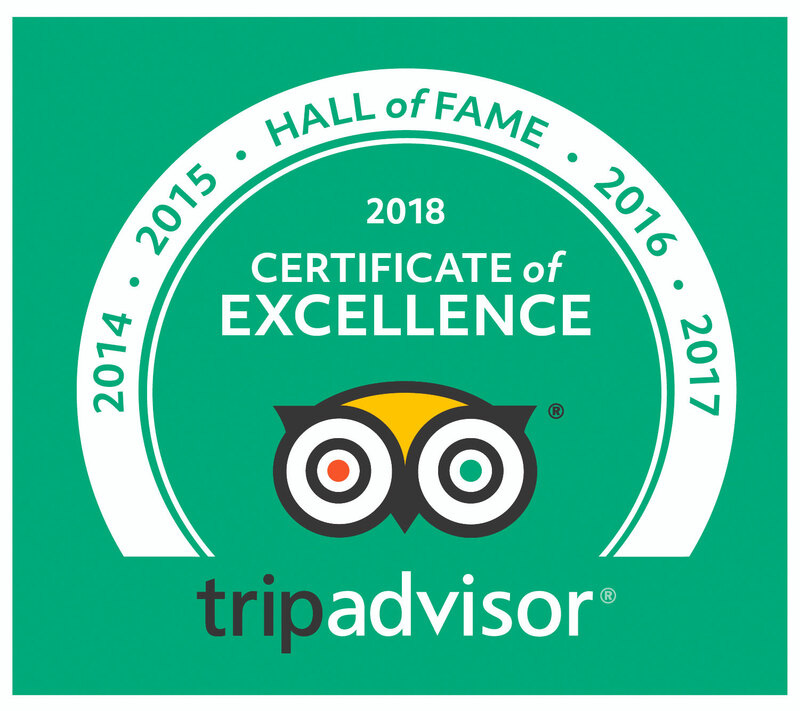 Please take me with you 🙂 Seriously, though, I’ll be in Tucson next April, and don’t know how close that is to Scottsdale… Great review – you make me want to eat there, too!